Which illumination solution is right for your facility? Time for a lighting upgrade? You may be torn between LED and induction fixtures. Both offer low maintenance needs, are compatible with a variety of applications, and can secure energy savings. Familiarize yourself with the basics of these technologies to uncover which one will bring your project to light. Pioneered by Nikola Tesla, induction lighting has been around for over 100 years – plenty of time to earn its “set it and forget it” reputation, says Mark Havira, senior lighting consultant at Efficient Lighting Consultants. Induction lamps rely on ballasts and sealed gas-filled bulbs. Unlike the Edison-style incandescents, induction lamps don’t require a fragile electrode burning inside the bulb to produce light, which allows life expectancy to reach 60,000 hours for retrofit kits or up to 100,000 for the latest manufacturer-provided systems. Declining component costs and continuing development are helping to drive down LED prices, Havira continues. The cost of induction systems is unlikely to budge much in either direction because the leaps in innovation have already occurred with induction – there’s not much else to improve on, whereas LED fixtures are still making notable strides. Most innovation in LED products now focuses on optimizing the entire system rather than individual diodes and other components, adds Gary Trott, vice president of product strategy for Cree. This change has contributed to the decline in cost. Ideal applications for induction systems include high bay areas, wall packs, and “anywhere there are metal halide, pulse start, mercury vapor, or high pressure sodium fixtures,” Havira notes. That sort of flexibility appealed to the University of California, Santa Cruz, which included induction technology in a portion of its campus-wide lighting retrofit in 2012. The $1.1 million project included a solution for the East Field House Gym’s uneven, insufficient lighting, which stayed around 20 fc. A design based on 3D lighting simulation led crews to replace 30 metal halide fixtures (all of which were either 175 or 250W) with a dozen 315W induction fixtures, reducing the fixture count by 60% while creating even light distribution and raising the light level to 35 fc. The wood floor in the gym is easily damaged by heavy equipment like the scissor lifts needed to change out malfunctioning lighting fixtures, making the low-maintenance requirement paramount among the team’s concerns. The existing metal halide fixtures not only consumed a high amount of energy, but they also weren’t conducive to controllability, which in turn worsened the energy consumption problem. The gym also requires careful attention paid to the fixtures’ safety, as wayward volleyballs can damage the motion and daylight sensors on the ceiling. Aided by financial incentives, UC Santa Cruz’s 2012 retrofit also replaced MR16, T12, and T8 lamps in 70 elevators with LED versions, cutting the elevators’ energy consumption by over 50%. Light and fan controls were added to compensate for the heat produced during round-the-clock operation, and automatic controls ensure that the lights and fan turn on for eight minutes when the elevator doors open, then shut off. Additionally, 230 150W HID streetlights were replaced with dimmable 85W LED versions and over 300 locations received bi-level LED wall-pack fixtures that can switch between 52 and 26W. The inclusion of both LED and induction provided an easy comparison for university staff. University of California, Davis faced a similar decision when they decided to roll out an exterior lighting retrofit covering 70% of the campus’s pedestrian paths, bike lanes, and roadways. About 1,200 street and area lights, 100 decorative post-top luminaires, and 100 wall-packs were replaced in 2011 and 2012, most of them with LED products. The post-top retrofits involved 45W light engines with zero to 10-volt dimming, while the HID wall-packs were replaced with LED versions that use 14W in low mode and 45W in high mode – less than a third of the HID luminaires’ consumption. Completed in 2012, the $950,000 project saves roughly 1,000 MWh and $100,000 a year. UC Davis originally planned to use induction lighting to replace high pressure sodium pole mounts in their parking lots, but opted to try LED instead. Additionally, the new LED lights provided significantly better color rendering over their high pressure sodium predecessors, Arntzen adds. This feature also appealed to Presence Saint Francis Hospital, an Evanston, IL-based Level 1 trauma center with 24/7 traffic. Its parking garage featured yellow high-pressure sodium fixtures that just didn’t pass muster. “When you go into a parking garage, yellow light does not give a sense of safety and security to people,” explains Joe Stark, regional director of support services for Presence Saint Francis and Saint Joseph Hospitals. The hospital initially planned to retrofit the existing HPS fixtures with LED lamps, but ultimately ended up installing pendant-mount LED luminaires instead. This secured lower operating costs for the garage and provides even white light that also resulted in clearer security camera footage. There’s no automatic answer to which lighting technology best fits your facility. To determine which product can meet your needs, consider these tips. 1) Run the numbers. Incentives and project bundling can help make projects more affordable. Some are specific to a particular lighting technology – for example, Efficiency Vermont currently offers 20% bonus rebates for some LED fixtures and controls in addition to its general incentives for energy-efficient commercial lighting equipment. 2) Think beyond the one-to-one swap. There’s more to good lighting than just changing out your old lamps for newer, more efficient ones, says Alexis Troschinetz, behavior change and metrics coordinator for Clean Energy Resource Teams (CERTs), a statewide partnership in Minnesota that provides resources for community-based clean energy projects. Westcor Land Title Insurance Company in Maitland, FL, opted to bypass the one-to-one temptation entirely by bringing in a lighting designer during a planned renovation. The designer was tasked with addressing the inconsistent light quality and constant buzzing sound of the existing fluorescent fixtures. The end result called for more than 100 LED downlights and over 200 troffers across the 20,000-square-foot space. The 90-plus CRI rating helped highlight the textures and brightly colored accents in the office. 3) What warranties are offered? If you’re switching to a new technology, determine whether the vendor’s offered warranty is compatible with your comfort level, Troschinetz recommends. 4) Do your research. When Testoni needs LED lighting, he tries to stick to products that are DesignLights Consortium certified, as the designation signifies a dependable level of quality and efficiency in commercial LEDs. In the late 1990s, a revolutionary idea arrived on the scene, shepherded by an innovative thinker and nurtured by scores of curious and passionate individuals. In the book Biomimicry, Janine Benyus introduced the notion that we could be better off by simply mimicking the ways problems are solved in nature; this idea has proven transformative. In the book, Benyus lists nine principles that govern and define how nature operates. Not surprisingly, elements of each of these principles are readily identifiable in connection with LEED. Just as nature is powered by the renewable energy of the sun, LEED promotes the use of renewable energy sources and the purchase of green power. If we were to consistently mimic the ways of nature, we would rely solely on renewable power. We can all learn a lesson from the Center for Green Schools; one of the key ideas taught to the world’s future sustainability natives is to take only what you need, not as much as you want. In addition to encouraging the use of renewable energy, LEED also rewards projects for optimizing energy performance, both newly constructed buildings and existing buildings can receive points for energy efficiency measures. This is a no-brainer, but it’s also something we very rarely pay conscious attention to. A tree is rooted in the ground to draw water and nutrients from the soil, it spreads its branches and leaves wide to increase its surface area and soak up the sunlight it needs to produce energy and grow. In the same vein, well-designed buildings and communities that adhere to the principles of biomimicry make optimal use of mass and space. LEED for Neighborhood Development capitalizes on this principle, encouraging urban planners and developers to make the best possible use of the space available and to design for the future. Think about it, everything produced in nature is biodegradable. Once the natural life of a pinecone has come and gone, it breaks down into essential elements and compounds that are repurposed. 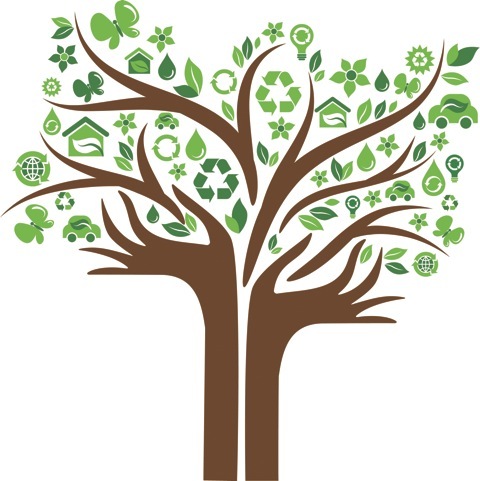 In the built environment, LEED recognizes projects that reduce, reuse or recycle construction materials and thatencourage recycling once the building is occupied. Additionally, LEED encourages project teams to engage in a life cycle assessment, considering available resources based on their ability to be repurposed. Very little in nature exists in isolation. By way of example, plants persist because of pollinators, which in turn feed on the nectar they collect. LEED also rewards cooperative forethought and effort with theintegrative process credit. Buildings that are designed with input and analysis from experts of diverse backgrounds capitalize on the differences and similarities between building systems, honoring the synergies that exist. Diversity is one of nature’s best insurance policies. We know that species with limited genetic diversity have more difficulty adapting to environmental change, and that ecosystems rich with diversity are more stable. Like a living system, LEED has evolved and changed over the years and is now applicable to a diverse body of building types including schools, healthcare spaces, retail facilities andhomes. There is a reason the term “invasive species” has such strong connotations, nature’s systems are inherently local. Certain species thrive under specific conditions; local and regional weather patterns matter, as do the types of soil, air particulates and water temperatures. Not only does LEED incorporateregional priority credits, which encourage project administrators to consider geographically specific issues, but LEED also has added incentives for the selection and use of raw materials that are locally sourced. Products and materials that are extracted, manufactured and purchased within 100 miles of a project are valued at 200% of their cost. Every natural system has a tipping point, a carrying capacity or a state of disequilibrium that triggers a change. Forest fires are a great example of a natural phenomenon that renews and refreshes, cutting down on excessive growth and allowing for regeneration. A large part of what makes LEED a successful system is the human element; in the end, green building is all about the people. The LEED Dynamic Plaque monitors usage and human experience, allowing building owners and occupants to identify excessive waste or usage and to adapt accordingly. All living things are governed by limitations; age, climate, population density and many other factors determine how species and systems develop. LEED recognizes the importance of identifying limits and finding creative ways to compensate for them. A building constructed in the heart of a city may have limited parking options, but LEED rewards project administrators and owners for building near public transportation hubs. If there is one take away this Earth Day from Janine Benyus’s simple list of natural laws it’s that there is an endless amount we can learn if we just pay attention to our surroundings. Building design and construction is an imaginative process and LEED provides credits in line with the best of what nature has to teach us about sustainable development. What can I do for Earth Day? The possibilities for getting involved are endless! Volunteer. Go to a festival. Install solar panels on your roof. Organize an event in your community. Change a habit. Help launch a community garden. Communicate your priorities to your elected representatives. Do something nice for the Earth, have fun, meet new people, and make a difference. But you needn’t wait for April 22! Earth Day is Every Day. To build a better future, we all must commit to protect our environment year-round. Founded by the organizers of the first Earth Day in 1970, Earth Day Network (EDN) promotes year-round environmental citizenship and action, worldwide. Earth Day Network is a driving force, steering environmental awareness around the world. Through Earth Day Network, activists connect, interact and impact their communities, and create positive change in local, national, and global policies. EDN’s international network reaches over 22,000 organizations in 192 countries, while the domestic program assists over 30,000 educators, coordinating thousands of community development and environmental protection activities throughout the year. The U.S. market grew 14 percent in 2014, five times the rate of the overall economy. The advanced energy sector has made it to the big leagues. At nearly $1.3 trillion in global revenue for 2014, the market for innovative energy products and services is now as large as the market for apparel and fashion, and almost four times the size of the semiconductor industry worldwide, according to a new report commissioned by the group Advanced Energy Economy (AEE). Last year was the biggest year for growth in advanced energy worldwide since AEE began tracking these markets in 2011 in collaboration with Navigant Research. Global revenue increased 12 percent compared to 2013. In the United States, the advanced energy market revenue grew 14 percent last year — five times the rate of the U.S. economy overall — to just shy of $200 billion, making it bigger than the U.S. airline industry ($180 billion), equal to pharmaceuticals ($200 billion) and nearly the same size as consumer electronics ($211.3 billion). U.S. advanced energy revenue has grown 38 percent over the last four years. Today, it represents 15 percent of the global advanced energy market. Advanced energy spans seven broad industry segments, including technologies such as solar, energy storage, demand response and natural gas turbines. Building efficiency is currently the largest segment of the U.S. advanced energy market, with revenue of $60.1 billion in 2014. According to AEE data, revenue in building efficiency has grown 43 percent over the last four years. Results in transportation were mixed, with a slight year-over-year revenue decline. U.S. revenue for hybrid vehicles fell by 19 percent in 2014, but went up by 34 percent for plug-in electric vehicles. Revenue from electric-vehicle charging stations jumped up 31 percent to $201.5 million, a sevenfold increase from 2011. Revenue from natural-gas-powered vehicles went up 26 percent. In electricity generation, solar energy and natural gas generating equipment both increased substantially, up 39 percent to $22.5 billion and 48 percent to $6.4 billion, respectively. According to AEE, the uptick in turbine sales indicates that the “natural gas revolution” is now translating into new orders, and not just boosting productivity at existing natural gas power plants. In 2013, wind energy saw a severe downturn in response to uncertainty over the federal Production Tax Credit. Revenue fell to $2.1 billion in 2013 from $25.5 billion in 2012, which was enough of a blow for all segments of U.S. advanced energy to show an overall decline of 4 percent on a year-over-year basis. But wind bounced back in 2014, reaching $8.2 billion. Based on the number of projects currently in the pipeline, 2015 could be a record year. Today, 4.4 percent of U.S. electricity comes from wind. Susan Reilly, president of RES Americas, said the wind industry’s goal is to produce 20 percent of U.S. electricity by 2030. “We know that’s possible, but it’s very dependent on policy,” said Reilly, speaking at an AEE event this week in Washington, D.C.
Policy will be a key driver of continued growth across the advanced energy sector, said Graham Richard, CEO of AEE. In particular, where federal tax provisions for advanced energy have been allowed to lapse, they need to be extended. “Making energy tax policy stable, predictable and technology-neutral so our industry can invest in growth for the long run is very important,” he said. State policy matters too, according to Richard. Regulations also need to change. Many utilities in the U.S. and around the world are paid for building new assets and selling electricity. As some parts of the advanced energy market continue to grow, they will diminish utility revenue by reducing the need for new capacity and energy sales. But at the same time, utilities are vital to the coming transformation in the power sector, according to leaders in advanced energy. “I think we need utilities to be a delivery vehicle for a range of solutions,” he said. A paradigm shift is taking place, said Tom Starrs, vice president of market strategy and policy at SunPower Corp. Today, utilities aren’t simply building supply and responding to demand; they’re modifying demand to meet the available supply, including from intermittent renewables like solar and wind. Advanced energy products included in the AEE report “can benefit the grid by really, tangibly reducing the costs of operating and maintaining the grid itself, while also improving not just sustainability, but also the reliability and resilience of the grid,” he said. A Philips logo is seen at Philips headquarters, where Philips CEO Frans van Houten gave a presentation of the company’s 2013 full-year results, in Amsterdam January 28, 2014. (Reuters) – Philips (PHG.AS) has agreed to sell an 80.1 percent stake in its lighting components division for $2.8 billion to Go Scale Capital, a technology fund that will seek to expand the company’s automotive and LED businesses. The deal announced on Tuesday is a prelude to an even bigger strategic move for Philips: spinning off its main lighting division, the world’s largest lighting maker, via a stock market flotation, as the Dutch group focuses on medical technology and selected consumer products. Philips said the deal values the components business, which comprises an automotive lighting unit and the “Lumileds” LED manufacturing business, at $3.3 billion including debt. ABN Amro analyst Marc Hesselink said the sale price was “considerably above market expectations”. The unit made a profit of 141 million euros on sales of 1.42 billion in 2014. Go Capital was advised by London-based Zaoui & Co, while Philips was advised by Morgan Stanley. Philips shares, which had hit a 14-month high of 27.675 euros earlier this month, eased 0.4 percent to 26.53 euros by 0952 GMT. Go Scale, which beat off competition from private equity firms to seal the deal, has previously invested in Boston Power, a U.S.-based manufacturer of electric vehicle batteries, and Xin Da Yang, a Eco-EV company in China. It said it plans to expand the business, building on Philips’ customer base which includes the likes of Volkswagen (VOWG_p.DE), BMW (BMWG.DE) and Audi. “We expect to see significant growth and unparalleled inroads into new opportunities such as electric vehicles,” Go Scale chairman Sonny Wu said. Go Scale is funded by GSR Ventures, with offices in Hong Kong, Beijing and Silicon Valley, and by Oak Investment Partners. Consortium partners include Asia Pacific Resource Development, Nanchang Industrial Group and GSR Capital. “There were other bidders, also good bidders, perhaps with fewer connections in the industry of semiconductors and the ability to help in building out scale,” Philips CEO Frans van Houten told reporters. Reuters had reported that rival bidding groups led by private equity firms CVC-KKR and Bain Capital had been vying for Lumileds until the Asian-oriented group entered the bidding in mid-March. LEDs, or light-emitting diodes, are semiconductor devices that emit light when an electric current passes through them. Although their use has boomed in recent years, the industry has suffered from overcapacity and price erosion. Philips has said its LED business has operating margins above 10 percent after a 2012 restructuring under Pierre-Yves Lesaicherre, but needs further investment to improve scale. Philips said it wanted to sell the subsidiary, which will be called “Lumileds,” because so many of its customers compete with Philips itself. Approximately 20 percent of component sales are to Philips’ own main lighting business. Warriors executives gave a public update on their arena plans for the team’s new home in 2018. The hottest team in the NBA is expected to have the most state-of-the-art stadium in just a few years. 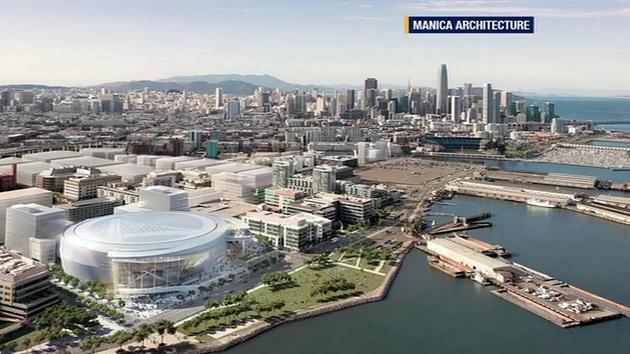 On Tuesday, the Warriors gave an update on their San Francisco arena plans. The team’s new home will be built in the Mission Bay area at 3rd and 16th streets. Warriors’ president Rick Welts shared the team’s vision with a Chamber of Commerce gathering. The new arena is expected to break ground early next year and open in 2018. The 12-acre-plot is in the developing Mission Bay neighborhood, near AT&T Park and the new UCSF Hospital complex. The Warriors believe the $1 billion showpiece will draw the league’s top players. “Plus think, most of our players are in their 20’s and the future of our world is being determined by 20 somethings in the Bay Area right now,” Welts said. Welts says the arena may also attract national political conventions. “I hope we nominate a president of the U.S. here,” Welts said. And get ready for big-name concerts. However, it’s the die-hard Warriors fans that need to buy in. Some fans are concerned the team will become kind of corporate and others say they’re excited to see a basketball team in San Francisco. The Warriors say their fan base at Oracle is about evenly split between San Francisco and the East Bay. Those demographics are now fueling a lively debate — if the hottest team in the NBA wins the championship, which city hosts the festivities? Still, with the team on a roll, you bet they’re thinking about it. You may be able to catch a Warriors game on ABC7 this weekend. We’ll know more when the playoff schedule is set. We do know the NBA Finals can be seen only on ABC7. Live coverage begins June 4. If you’re looking for residents who have incentives to pay their rent on time each month look no further. Those who qualify for federally sponsored housing assistance programs backed by the only organization that can legally print money…the federal government…awaits you! The oldest program has been around nearly 80 years! Section 8 of the Housing Act of 1937, authorizes the payment of rental housing assistance to private landlords on behalf of approximately 3.1 million low-income households. It operates through several programs, the largest of which, the Housing Choice Voucher program, pays a large portion of the rents and utilities of about 2.1 million households. The US Department of Housing and Urban Development (HUD) manages the Section 8 programs. One property manager I interviewed who participates in the Housing Choice Voucher program said she feels secure knowing the government funds will be deposited in her client’s bank account every month. She explained the HUD-managed program was meant to pay for “a portion” of the rents and utilities of those in its care. But often, as she explained, payments are greater than competitive rental prices. Instead of renting a recently vacated house on the open market, the property manager encouraged her landlord-client to offer it to the local Section 8 housing authorities. They found a woman with two children to rent it. “The Section 8 people offered to pay us $1,600 a month for this property, which is about $300 more than it’s worth”, the manager told me. “After my client pays the monthly expenses – the mortgage, maintenance, and taxes – we are netting more than 12% on this investment. That’s a nice return in today’s world”. So, as she informed me, even if the resident doesn’t pay, the government still deposits $1,200 into their account, no questions asked. The resident is responsible for the remaining $400. But there’s no reason for the landlord to worry about their renter’s $400 payments. The local Public Housing Agency make sure she pays her part. They act as “the enforcers”. The owners don’t even worry about her making payments on time; because the local agency handles that challenge also. Then I asked what would happen if she and her children trashed the place? I was told that the local officials dutifully inspect the house and make sure it stays in good condition. In effect, they do the work of a property manager, free of charge. The owner-client still wanted a property manager to be their “liaison” between them and the local agency. But since the property manager hardly needed to do anything they negotiated a lower fee then the standard 10% of the rent normally paid to a property manager. When the lease expires, if the resident leaves, the government finds another resident to take her place – on the same terms, which saves the property manager and the owner that responsibility. The best part was that it’s all guaranteed and supported by the federal government. Everyone including the resident came out ahead. Remember, public housing is limited to low-income families and individuals. The family or individual’s income cannot exceed 50% of the median income for the area. There are strict guidelines that owners and tenants must follow to be eligible to participate in these kinds of program. For specific details, contact your local Public Housing Agency.